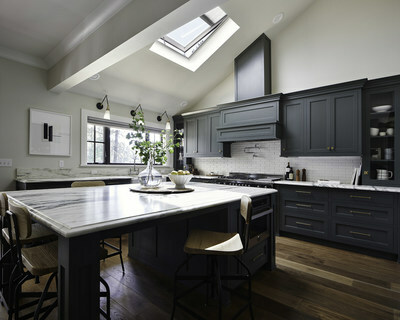 FORT MILL, S.C., March 15, 2019 /PRNewswire/ -- VELUX® is partnering with interior designer and style expert Emily Henderson to give one winner the chance to brighten up a room in their home in need of natural light. The Brighten Up Any Room Giveaway, which opened this week, will award one winner a one-room makeover by Henderson that includes two VELUX No Leak Solar Powered "Fresh Air" Skylights with solar blinds and installation. In addition, the winner will meet Emily and collaborate on the design that will transform their room. "The Brighten Up Any Room Giveaway is the perfect opportunity to share the transformational power of natural light in any space," said Chan Hoyle, national marketing and communications manager for VELUX Skylights. "We are excited to partner with Emily and look forward to seeing not only how natural light is incorporated into her final design but also the homeowner's reaction to a lighter, brighter space, as well." One of Emily's philosophies is using interior design to make people's lives better, whether it's making them feel happier in a space or making the space function better. She is also no stranger to working with skylights. She's used them in past projects, including in a Portland, Oregon, home renovation where she used skylights to help a small kitchen feel larger and to shine natural light on exposed beams in the master bedroom. The giveaway opened March 14 and closes April 11 at 11:59:59 p.m. It is open to anyone 18 or over who owns their own home. Please see contest rules below. Click here to enter. VELUX is the world leader in skylights and roof windows and is one of the strongest brands in the global building materials sector. VELUX America products are available nationwide through home centers, building material suppliers, lumberyards and independent door, window or roofing retailers. Consumers can locate local suppliers and installers and access information on skylight selection and the benefits of bringing more natural light and fresh air into the home by visitingveluxusa.comorwhyskylights.com. VELUX skylights are made in America in Greenwood, South Carolina.